As Comic-Con winds down to a close each year, it is always interesting to realize what people are talking about most. This year there were two pilots aired during Comic-Con that I consistently heard people saying good things about. 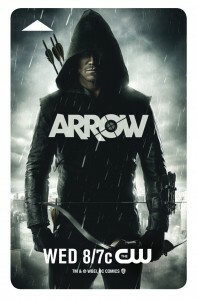 One I did not have a chance to see, Arrow. One woman from Australia very coyly told me, "there's this thing with his father... oh I hope they do something with it, because it looks like it could just be so..." then she glanced around as if some one might over hear us, "interesting!" I admit it, as curious as I already was, tidbits and rumors like that moved it up my list of I want to see this when it comes on. I don't read the comic book it is based on, or perhaps I should say inspired by, but as often as not, that is a positive as much as a negative. I imagine they'll change as many things as they keep... and I am now chomping at the bit to find out just what it is they might be doing with his father. The other TV pilot that had people talking, and me right there among them, was Cult. We'll have to wait until mid-season, which is always hard. There are times when I wish Comic-Con were more than once a year, as I know those who come see this as their one chance for the next 11 months and 3 weeks to show us anything and everything they want us to see, so sometimes we see things so very very far ahead it makes the mind spin. But the rest of me knows Comic-Con is such a sensory overload I can't imagine many of us would survive it two or four times a year. When the other pilots I saw air, I'll tune in, The Following, 666 Park Avenue, and Revolution all appear well worth giving a chance. And hopefully, next year, I'll be attending a panel for a second season of more than one of the shows I've discovered thanks to the 2012 Comic-Con International in San Diego.